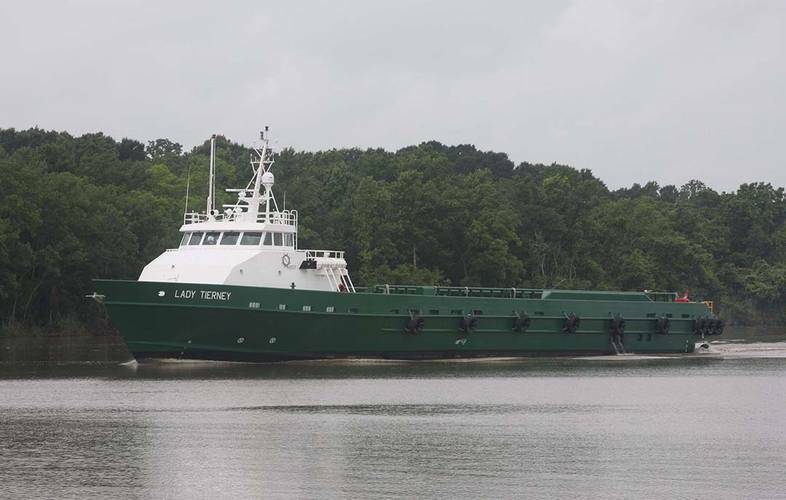 Lady Tierney, a 205-foot monohull DP-2 crew supply vessel, has been delivered for Sea Supply, Inc., a B&J Martin Inc. subsidiary, of Galliano, Louisiana. 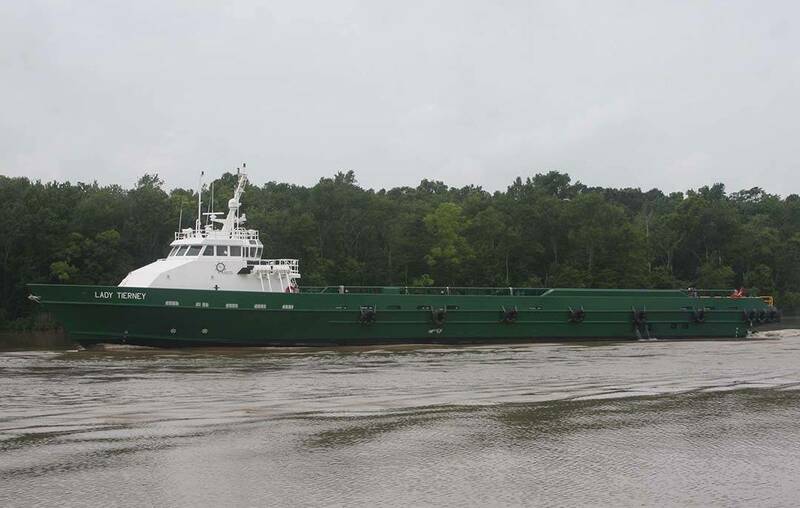 With design expertise from Incat Crowther’s Lafayette, La. office, combined with concept design and standards from the Morgan City, La. based Halimar Shipyard and the vessel owner, the ABS-classed, USCG-certified vessel will work in the Gulf of Mexico’s deep water offshore industry. For transportation of supplies, Lady Tierney features an aft cargo deck comprising of 3,950 square feet of timber covered area with a capacity of 450 LT. Also featured on the aft deck are two FFS 1200LB, 5,300 gpm fire monitors for emergency fire extinguishing. 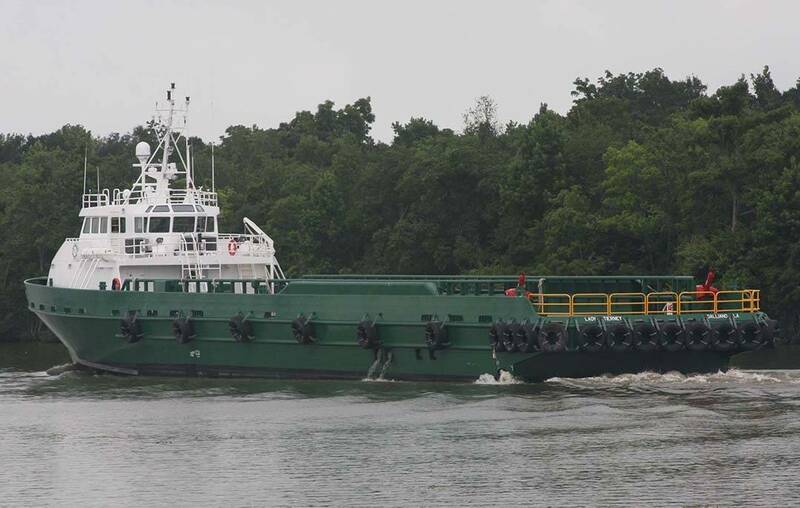 Forward of the cargo deck is a main cabin featuring seating for 50 passengers, plus a bathroom, a dedicated luggage area, a storage room, a room for dynamic positioning equipment from Beier Radio, plus an HVAC closet. A deck locker accessible from the cargo deck is also integrated into the main cabin. Above the main cabin sits a wheelhouse featuring forward and aft control stations, with DP controls at the aft station that provides views of the cargo deck and offshore structures. Inflatable life rafts are situated outboard of the wheelhouse on each side of the vessel and are accessible for rapid deployment in case of an emergency. Below deck crew accommodations features fivecrew staterooms, each with double bunks and locker, a bathroom, a HVAC closet, galley, pantry and a mess/lounge area. Forward of the crew accommodations lies a bow thruster compartment featuring two Thrustmaster 30TT200AL tunnel bow thrusters. A series of tanks located between the engine room and crew accommodations have a capacity of 20,720 gallons of ship’s fuel, 44,000 gallons of transferrable rig fuel, 44,330 gallons of transferrable rig water, and 2,600 gallons of ship’s water. The engine room includes main propulsion machinery consisting of four Caterpillar 3512C, Tier III engines operating at 1911 bhp at 1,600 rpms coupled to Twin Disc MGX 61000 SC reverse reduction gears. Each engine drives a four-bladed NiBrAl propeller enabling a top speed of 27 knots and the two inboard engines are also arranged to drive FFS SFP 250x350 XPC fire-fighting pumps. The generator room houses two John Deere 6090AFM75, 150ekW generator sets and two John Deer 6090AFM75 auxiliary engines providing power for bow thruster hydraulic pumps. The steering gear room features a Beier Radio (Sentinel Controls) steering system to control the two oversized stainless steel rudders which enhance station keeping and maneuverability.